recommendations, and someone suggested rutabaga with carrots! So I decided to try it. 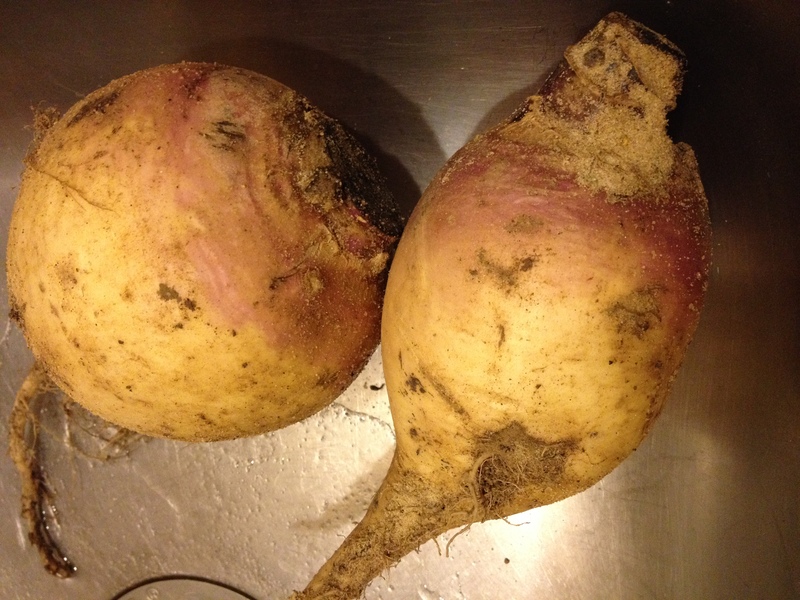 Rutabagas fresh from the farm! No wax – the way they should be! 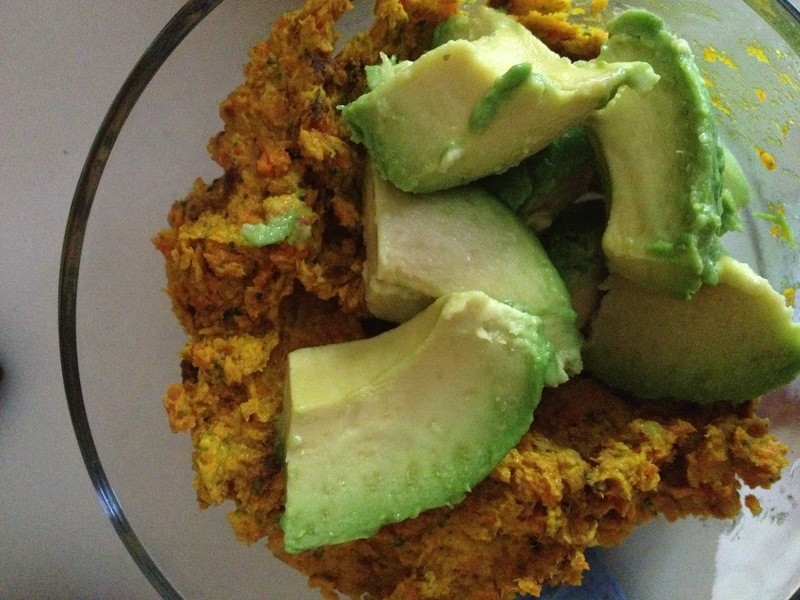 vegetables and protein, or as part of a recovery meal for athletes. – extra virgin olive oil to spray on – 2 tbsp? 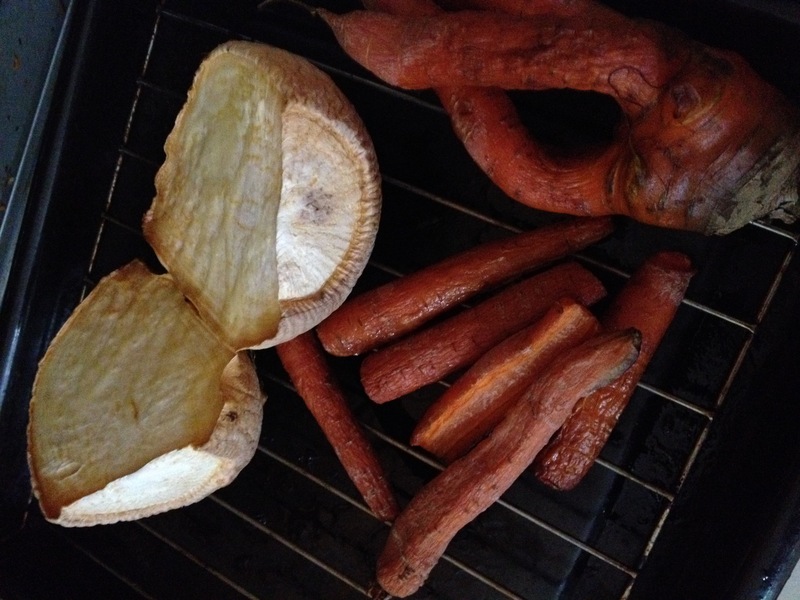 Roasted rutabaga and carrots in oven. 1. After you wash or peel rutabaga and carrots, slice the rutabaga into 1/2 inch slices. Place rutabaga and carrots on foil or parchment paper on a cookie sheet. Spray with olive oil. Can also add a clove or two of garlic here! 2. Roast at 325*F for 30 minutes (might be more depending on the rutabaga) until soft and preferably a bit caramelized (browned). If not soft, return to oven at 10-15 minute intervals until you get the desired softness. NOTE: I cut the rutabaga in half, and it just took forever to roast! I think it was over an hour. So slice it! 3. Remove from oven and let cool. Place the roots, garlic (I used 1 roasted clove and 1 raw clove), parsley, lemon and spices into a food processor. Process until smooth. You could probably add butter if you wanted, but I did not. This is what it looked like in a bowl when done. I also added 1/2 cup of flax seed meal and this gave it more body, but also made it a bit less creamy the next day. It was really good while it was still warm! I would also recommend adding ghee when eating it warm (or butter). I had it also the next day for breakfast with avocado slices and a bit more sea salt and tsp of my own balsamic vinaigrette. It was a perfect recovery meal! Even without the protein. ate it or if made some modifications. If you have questions about how to use a root vegetable, please let me know via email, joanna@nutrition-in-motion.net or comment in blog comments section – I promise to figure out a great recipe and post it after I perfect it and make it not only tasty, but easy to make! Joanna Chodorowska, BA, NC, TPTH is a sports nutrition coach and multi-dimensional healer who loves to use real food in her own diet as well as help others utilize them more in theirs. Real foods do make you feel better! She can help you find healthy for you! For more information about her programs, please visit www.nutrition-in-motion.net/services.